The honeymoon is over. At the beginning of every term things putter along easily enough while I wonder why I felt so stressed out at the end of the previous term … and then marking starts to come in, and the new assignment sequences dreamed up over the break loom on the horizon and require planning and handouts and Blackboard drop-boxes, and forms for the letters of reference I forgot I still needed to do appear in my inbox, and the thesis material I made my students promise to have ready duly shows up. And that’s about where I am now, staying on top of things but with effort. It doesn’t help that it’s winter (when has winter ever helped with anything?). It takes more energy to do everything in the winter, from driving away in the morning (bundling up, scraping, clearing) to just staying warm (even my LL Bean fleece slipper socks are just not enough this year, down in my basement office with the cold, cold floor). When the ducks and green peas came, we looked at each other in dismay; we had only two-pronged, black-handled forks. It is true the steel was as bright as silver; but what were we to do? Miss Matty picked up her peas, one by one, on the point of the prongs, much as Amine ate her grains of rice after her previous feast with the Ghoul. Miss Pole sighed over her delicate young peas as she left them on one side of her plate untasted, for they would drop between the prongs. I looked at my host: the peas were going wholesale into his capacious mouth, shovelled up by his large round-ended knife. I saw, I imitated, I survived! My friends, in spite of my precedent, could not muster up courage enough to do an ungenteel thing; and, if Mr Holbrook had not been so heartily hungry, he would probably have seen that the good peas went away almost untouched. I’ve always found peas quite inconvenient myself — and not particularly tasty, though I do occasionally serve them now that I’m All Grown Up (my parents could testify that this is a sign of maturity beyond what they would have predicted, given my childhood aversion to most green vegetables). Next up in this class is The Mill on the Floss. It’s not cheerful (well, the first part is pretty funny, but after that … ) but I’m really looking forward to it, especially after having worked up my essay on it for this month’s Open Letters. In Intro to Lit, we had our first general class discussion of The Road today, and the students seemed quite engaged with it. We warmed up by talking about things like the title (I always start there with novels!) — why “the” road, why not any road in particular (especially considering they have a map), why just “the man” and “the boy,” what seems to have happened, what matters to them now, what is their relationship like, and so on. There’s lots more to talk about, but for Wednesday I want us to focus on the language of the novel for a while. 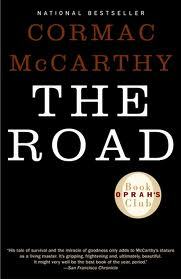 I am aware that admiration of McCarthy’s style is not universal, and I’m not altogether convinced about some aspects of it myself, for all that I find the novel both gripping and moving. It’s a conspicuous style: there’s no illusion of transparency and there are a lot of what could be considered affectations, from the eccentric punctuation (argh! the apostrophes!) to the use of obscure words (obscure to me, anyway — words I had to look up for today’s installment included “rachitic,” “gryke,” and “kerfs”). Most sentences are very short, and indeed many are fragments, but some are longer and more elaborate, even florid. Because the novel is quite suspenseful, it’s easy to read along quickly and not fret the details (I didn’t look up any of these words on my first reading), but that’s obviously not good enough. I think we might try an exercise on “found poetry” in The Road. I think that this would focus our attention very closely on details of wording, including not just meaning but also sound, placement, and relationships to major themes. It would also probably prompt some useful discussion about what we think makes prose “poetic.” So! A handout for a group activity along these lines goes on the to-do list for tomorrow.